In this Photoshop Effects tutorial, we'll learn how to give someone's eyes a fun, easy to create "zoom" effect, with blur streaks that appear to zoom out from the center of the eyes. We'll also bump up the brightness and color saturation of the eyes at the same time, all using Photoshop's Radial Blur filter, a basic selection tool, a simple layer mask, and a layer blend mode! This version of the tutorial is compatible with Photoshop CS5 and earlier. For Photoshop CS6 and CC (Creative Cloud), check out our fully updated version. 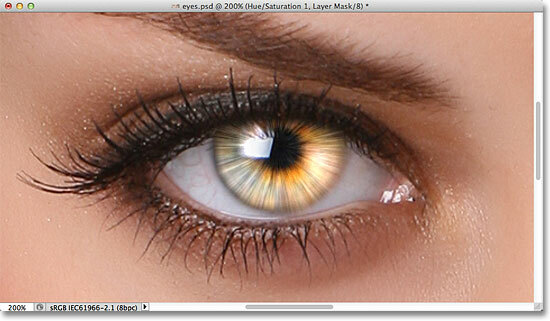 We're going to use the Elliptical Marquee Tool to draw a selection around the iris (the colored part of the eye). In my case, because the upper part of the iris is covered by the woman's eyelid, selecting the iris with the Elliptical Marquee Tool will be a two-step process. The initial elliptical selection extends up into the eyelid, but we'll fix that next. Clicking on the Intersect With Selection icon (fourth icon from the left in the row). Drawing a second selection around the part of the initial selection I want to keep. The top part of the initial selection has been removed. Hold down Alt (Win) / Option (Mac) and go to Layer > New > Layer via Copy. Name the new layer "Left Eye". The selection now appears on its own layer above the photo. Draw a circular selection slightly larger than the iris. Set the noise amount to 10% and make sure Gaussian and Monochromatic are selected. The image after adding noise to the selected area. The Radial Blur dialog box. The image after applying the Radial Blur filter. The layer mask thumbnail tells us that a mask has been added to the layer. Paint with black to clean up the white part of the eye around the iris. If you make a mistake and accidentally paint over the iris, simply press the letter X on your keyboard to swap the Foreground and Background colors, which makes your Foreground color white. Paint over the mistake to bring back the blur effect, then press X again to change your Foreground color back to black and continue painting around the iris. Painting away the blur streaks in the pupil. Hold Alt (Win) / Option (Mac) and click on the New Adjustment Layer icon. Select Hue/Saturation from the list. Select "Use Previous Layer to Create Clipping Mask" and change the Mode to Screen. The Layers panel showing the newly added Hue/Saturation adjustment layer. The iris is now brighter thanks to the Screen blend mode. Drag the Saturation slider towards the right to boost color saturation in the iris. The image after increasing color saturation in the iris. Changing the blend mode of the adjustment layer to Color Dodge. The image after changing the blend mode to Color Dodge. Trying out the Linear Dodge blend mode. The same effect using the Linear Dodge blend mode. 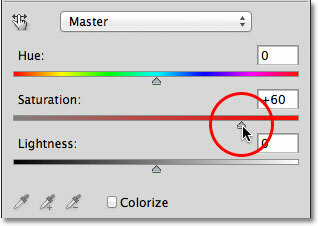 Lower the Opacity value if needed to reduce the brightness. 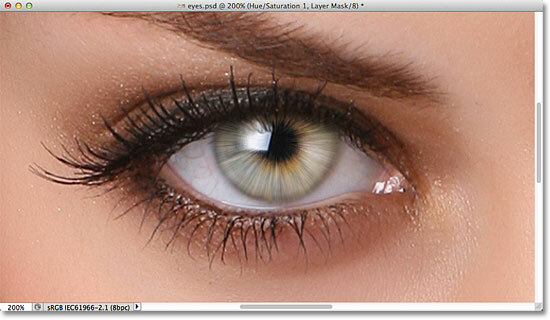 Make sure you re-select the Background layer before starting on the other eye. The final "Radial Zoom Enhanced Eyes" effect. And there we have it! That's how to give eyes a "radial zoom" effect with Photoshop! Visit our Photo Effects section for more Photoshop effects tutorials!